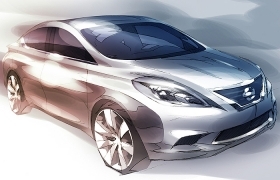 Nissan released this sketch of the next-generation Versa that is coming to the United States. DETROIT -- The next-generation Nissan Versa will be sold in the United States, the company announced today. A sketch released shows a more sculpted and lined compact than the current car. Nissan sold 7,021 Versas in September in the United States, an increase of 47 percent over the same period in 2009. Versa sales through the first nine months of the year are up 20 percent, to 76,736 units. Look for the new Versa to arrive sometime next year as a 2012 model. It was introduced for the 2007 model year as Nissan's entry-level car.